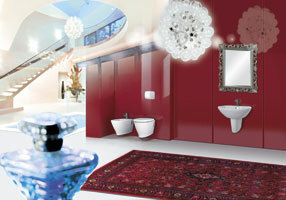 The passion of the Palazzani family for taps and bathroom furnishings has deep roots in the past. Since then the years have brought many new innovations, but the enduring love of the family for design and beauty, creativity and high-quality Italian workmanship have remained intact. Collaborations with leading designers such as Antonio Bullo have brought our products to a very high aesthetic level and have made Palazzani one of the most important Italian brands for the manufacture and creation of fixtures and ceramic fittings for bathrooms. Collaborations with leading designers such as Antonio Bullo have brought our manufacturing to a very high aesthetic level and have made Palazzani one of the most important brands for the creation of fixtures and ceramic fittings for Italian bathrooms. Palazzani, which is based in Casalmorano in the Northern Italian region of Lombardy, is therefore proud to present its new variants of the single-lever Mis mixer (Antonio Bullo design): the Mis Color line, which is available in green, orange, white and black. The company has also created three new fine satin finishes: brushed copper, polished nickel, brushed nickel, all specially created for the Cersaie Exhibition. Deriving from the need to combine design, functionality and color, Mis is dedicated to customers who are looking for something truly different and unconventional: people who will admire the clarity of design and shape but with an attractive touch of color. Young is a mixer tap with compact, functional and strikingly linear forms. The chromium plating with a thickness of no less than 20 microns means that Young, like all taps and faucets manufactured by Palazzani, is a product of the highest quality and durability over time. Young is designed, as its name says, for our more youthful customers who are attracted to original and avantgarde ideas . We are sure that they will instantly fall in love with its strong and uncompromising design. The soft and rounded shapes of the Wild mixer tap give the user a unique tactile and sensory experience . Its tastefully indented handle is created to assist your hand in the simple gesture of turning the tap on and off. It is an attractive object that is further enhanced by association with a rounded washbasin, so as to create a tasteful and elegant harmony. But Wild is highly versatile, with a form that is suitable for many combinations, and it also goes well with more angular basins and sinks. For those looking for cutting-edge tap and faucet design Clack has now been created: a mixer that represents continuity between the past and the future. It is available in both the classic one-lever version and a taller version, and it is ideal for bathrooms with well-defined but unusual shapes that have a strong personality. The high-quality ceramic products manufactured by Palazzani go very well with the most refined and innovative developments in the sector of design for the bathroom. 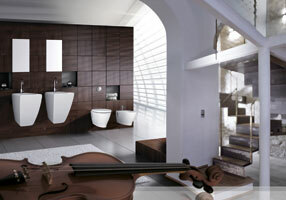 Top-mounted washbasins are some of our foremost creations, for example Zip is a basin with a wide and open shape. This makes it stand out exceptionally well on any simple and linear washstand or table-top that can enhance its low contours, but it is also a perfect solution if you have opted for a more classic bathroom look. Drag has a more complex, sinuous and Zen-like appearance. It is a top-mounted washbasin in white ceramic, with soft curving lines that recall the irregular outlines of pebbles in a river or on the beach. It can be combined with simple and minimal shapes and natural materials such as wood, stone or glass that call to mind the basic elements that have inspired its form. With its semi-conical organic profile Net seems to be based on the flared calyx of a lily. This top-mounted ceramic basin is the perfect choice if you are trying to create a stylish and striking bathroom, in which both surprise and beauty have an important role. 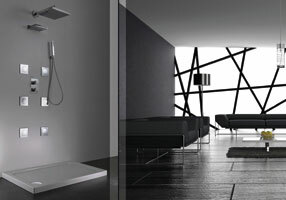 It is best combined with wall-mounted taps or tall taps such as Pin or Clack. Palazzani does not only deal with ceramics and also Corian®, an elastic and pliable material, is used in our Avi line to give reality and shape to the dreams of all true devotees of design. 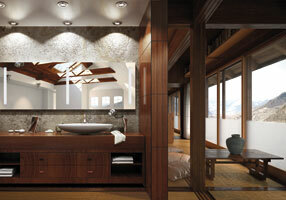 The Avi bathtub is a marvel that immediately brings to mind the concept of luxury. It will become the genuine oasis ofpeace and relaxation you desire in your own home, for a bathroom that is not only useful but that has become your ownprivate spa. 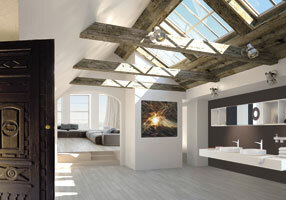 Thanks also to the chromotherapy shower, of which there are several different models in our range for you to choose from,well-being and luxury in your own bathroom are easily accessible at last.